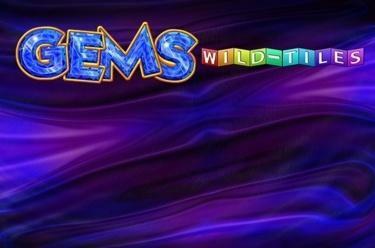 Play Gems Wild Tiles™ online for free now! This slot does everything a little differently and that's why it is so appealing! Gems Wild Tiles™ doesn't make do with boring win lines, here the symbols - the most beautiful gems - can land vertically as well as horizontally. Just land 3 of them and Twists will rush into your account. But here's the trick: The more right combos you land with your spin, the higher your winning multiplier and the greater the chance for a headstart in your bonus game! 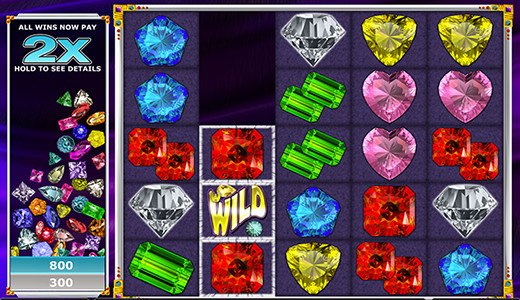 Landing 3 matching symbols either from left to right or right to left will grant you a win with Gems Wild Tiles™! The WILD symbol gives you a helping hand in this slot without defined win lines: It acts as a joker and substitutes for any symbol to complete your winning combinations. Gems Wild Tiles™ has neither fixed win lines nor spinning symbols on the reels. Instead, it's raining gems from above: You win, when 3 of them land in a row or a column! The middle symbol is replaced by a WILD symbol in a combination of three. The remaining symbols of the winning combo disappear and the symbols above drop and take their places. The spin ends with "Game over" when no more winning combos can be created. Afterwards the next spin starts. The winning multiplier increases with every winning combo you land during the game. The display to the left of the playing field shows the amount and number of your winnings as well as the amount of the winning multiplier. For some spins reels are displayed with the word "Bonus". The bonus game is triggered if you succeed in removing all symbols from the "Bonus" reels with winning combos during the spin. All reel positions are marked with a "?" in this feature. If you click on them they reveal themselves and a gem, for example a diamond, is shown. Subsequently all fields concealing identical gems are disclosed. You win a further bonus round if you have reached the number of identical gems displayed to the right of the playing field. If this is not the case your winnings will be multiplied with the number of "Bonus" reels cleared and the regular game is restarted.